Project finance refers to the kind of financing received by a specific project whether this project is for a railway, toll road, mine, pipeline, ship, hospital or power station. It also involves the process of financing long-term infrastructure, public services and industrial project. The type of financing which these projects can receive will be based upon a limited recourse or a non-recourse financial structure which means that the debts and equity used in financing the project are being paid back through its acquired cash flow. If you are planning to learn more about project finance by deciding to participate in a reliable project finance certification program, then you should keep in mind that project financing process is different from other types of financing since the financier of this project will spend time looking at its assets and revenues to secure a loan. In your attempt to become an expert after receiving your project finance certification, then you have to make sure that you fully understand the rationale of the entire project financing process including the methods used in preparing a financial plan, designing a financing mix, assessing risks and raising funds. You should also learn to analyze different types of project financing so you will know why the other plans for project financing achieves success while the other fails. You should also have enough skills and knowledge in designing contractual arrangements that are capable of supporting your project finance plans as well as the process of effectively preparing cash flow projections. All these will help you become effective in the field of project financing. 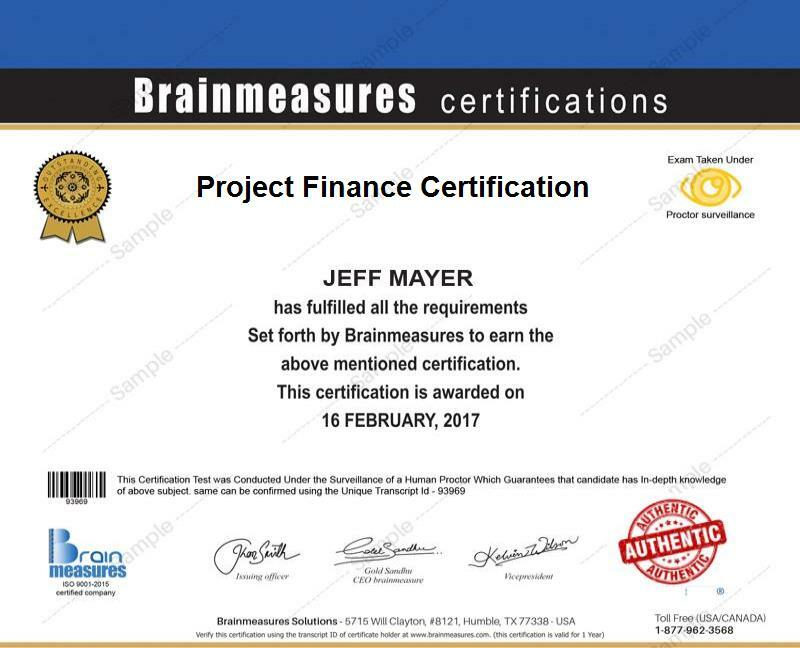 If you want to obtain a clearer idea about how project financing works, then the Brainmeasures project finance certification program can provide you with all the information that you need. The project finance course in Brainmeasures is comprehensive and competitive enough that it helps you get a stronger hold on the concepts and principles behind project financing. You will learn everything about the field including the different financing structures for both private and public projects, tax and accounting considerations and the credit requirements that are usually set by lenders. This online certification course is also guaranteed to help you learn the basics of analyzing the borrowing capacity of a project as well as the procedures involved in evaluating its feasibility. All the information that you will get from the whole project finance certification program offered by Brainmeasures will give you an easier time passing the online finance test and in making you more deserving to receive your skill certificate. The project finance certification program is primarily designed for people who wish to understand the procedures involved in financing different types of projects. This works perfectly for finance and banking professionals and individuals who are responsible in appraising large and medium industrial and infrastructural projects. If you are serious about completing a project finance certification course, then you should take note that the annual average salary for certified experts in the project financing industry is around $79,000.